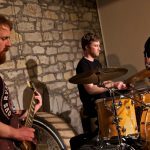 We had a successful run of shows in some of Ireland’s beautiful theatre spaces including, ‘Theatre Royal’ (Waterford), ‘Firkin Crane’ (Cork Jazz Festival), Watergate (Kilkenny) and Glor (Ennis). 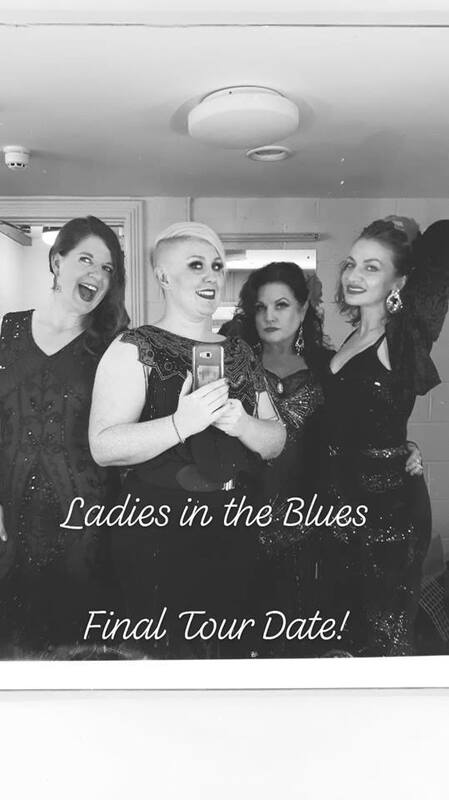 It was so much fun singing with my sistas of blues! Between an appearance on RTE news.. a few ladders in a few tights… James Delaney on a grand piano (in Glor) and singing our heart out at a late night trad session in Ennis. Join us in Caffrey’s on New Years Eve to ring in the new year in style! What a night we have in store for you all! 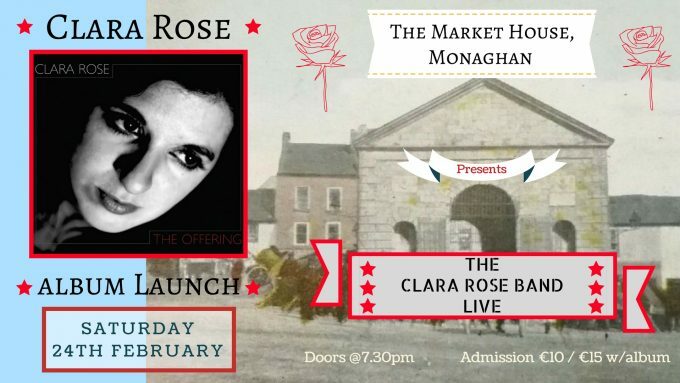 Clara Rose had her Monaghan Album Launch in Monaghan’s beautiful heritage arts centre, ‘The Market House’ on Saturday 24th February. 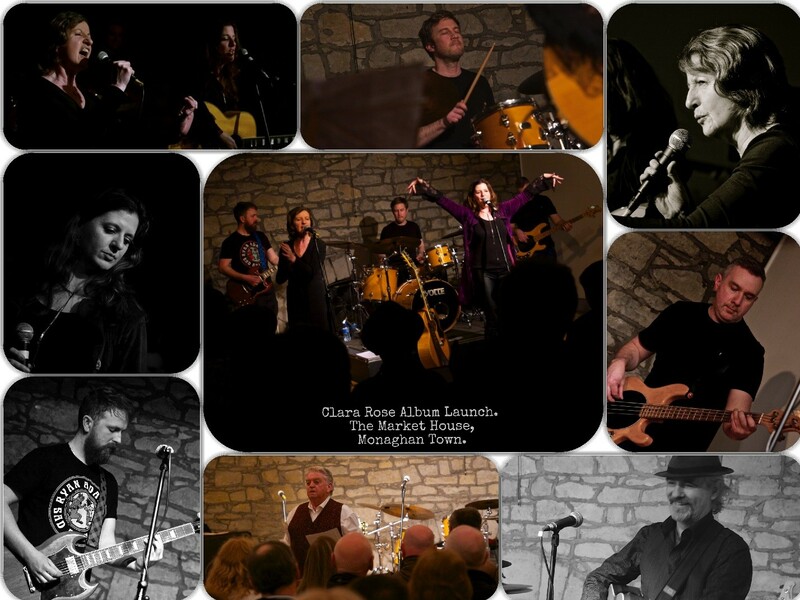 The sold out show was a great night with performances from The Clara Rose Band and special guest appearance from, ‘The Monahan Family’ (my wonderful parents Alan & Liz Monahan) fresh from their mini-tour of Northern Italy in January 2018! We had a gorgeous wine & drinks reception in the surrounds of The Market House. Sound on the night was by the legendary Ronnie O’ Flynn and the concert was M.C’s by Clara’s uncle Pat Deery. ‘The Offering’ is now officially in the ether. It is available for purchase in the ‘Music Store’ on this website, for download on CD Baby, iTunes and streaming on Spotify. Thanks SO much to you all for your continued support. It means a lot to me as I love to sing! My new album, ‘The Offering’ was officially launched in February 2018 with two sell-out launch shows in Dublin and Monaghan. 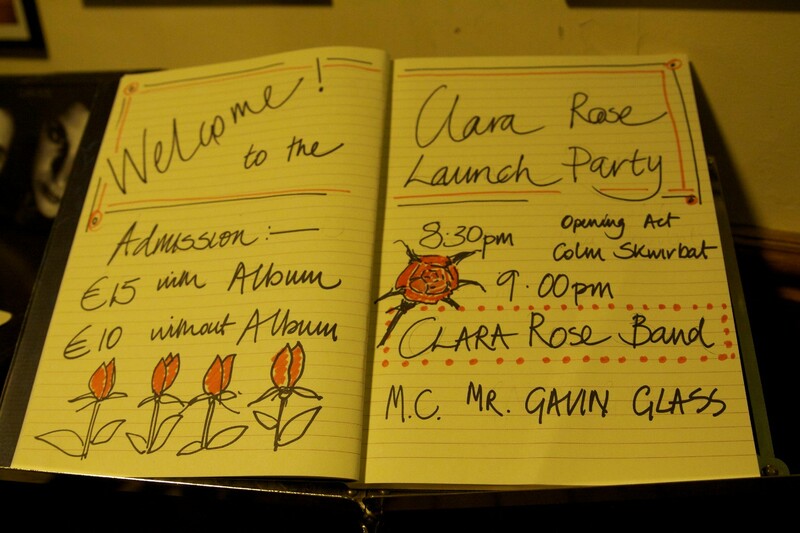 Both shows featured performances from The Clara Rose Band and some special guests. Here’s a small snapshot of the Dublin show:. 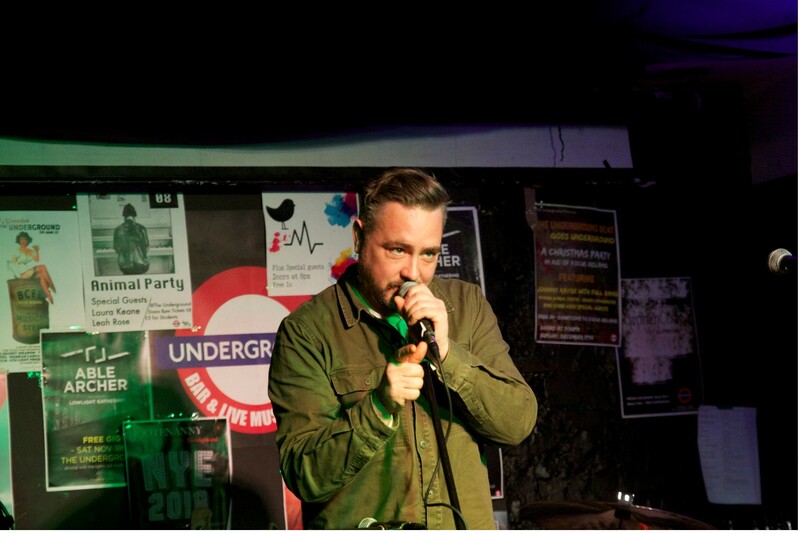 My Dublin album launch took place in one of Dublin’s newest venues, The Underground, Dublin. I chose this venue because it’s intimate, funky, great vibe with top drawer sound and the Guinness is good. I wasn’t disappointed. It was all that for the launch and much more! The proprietor Abner Brown treats all musicians so well and he has a great love of music himself. 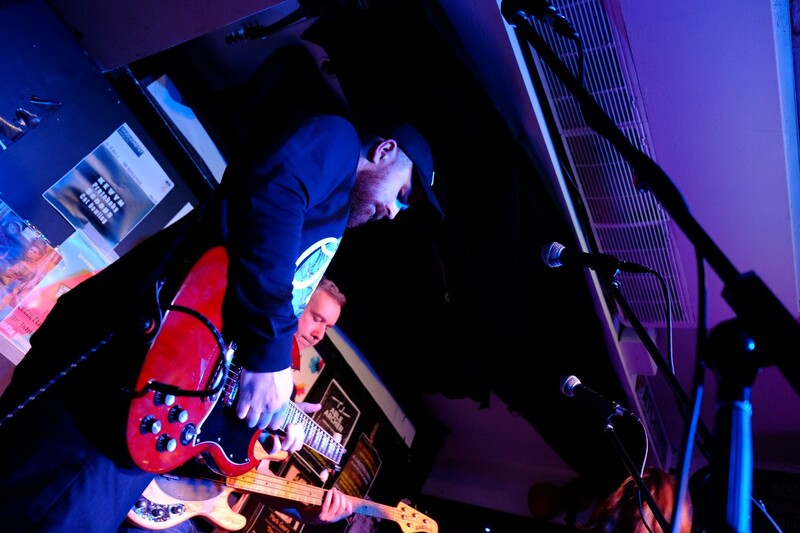 A music venue that’s ALL ABOUT THE MUSIC. What more could you want? All in all the night was exactly how I planned: Rock n’ roll.. hot… sweaty… full of great people and good vibes. M.C on the night was my album Producer and Radio Nova DJ Gavin Glass. Greeting the audience with “Hello you beautiful dreamers” and saying a few lines about recording the album in Orphan Recording he got the night kicked off in style! Opening the show we had the musical stylings of up and coming bluesman Colm Skwirbat (Performing ‘Too Much Alcohol’ live). His rare vintage guitars and cigar-box guitars and old style blues were real treat for the audience! 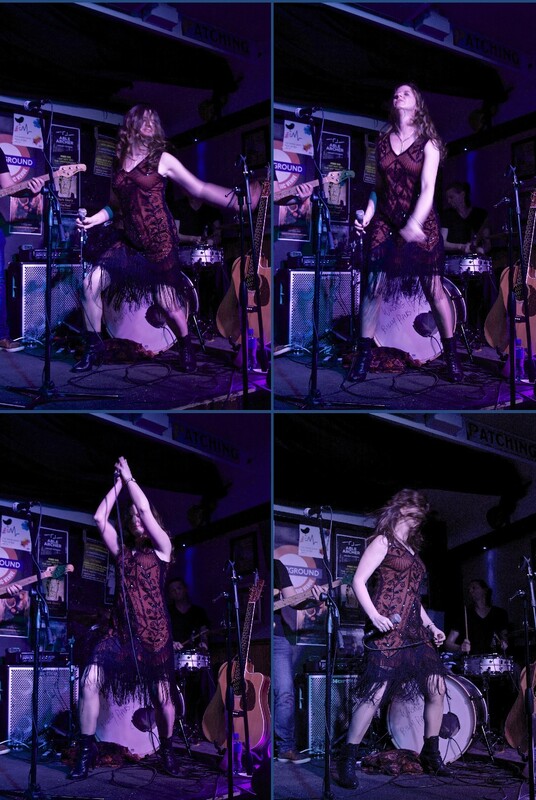 The Clara Rose Band took to the stage at 9pm and treated the packed house to a full on 2 hour show! It was non-stop rock and roll. 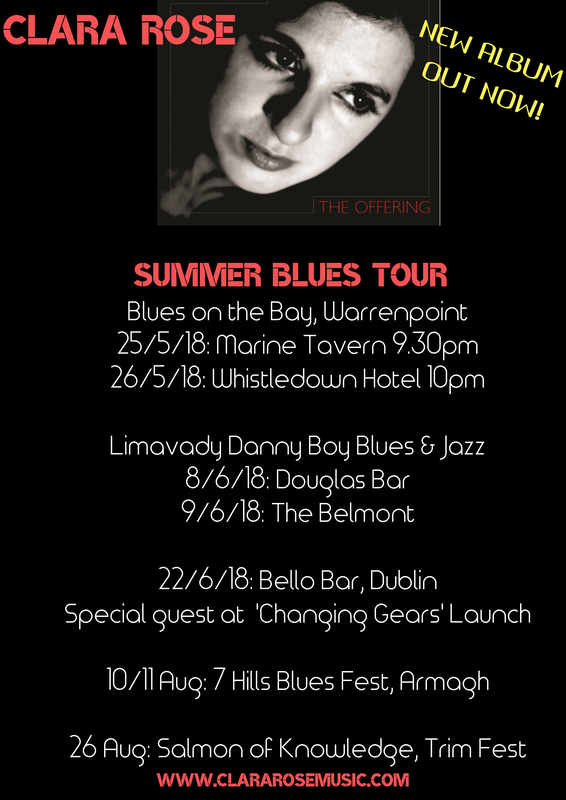 We performed the album, ‘The Offering’ in it’s entirety as well as some of my back catalogue and a sprinkling of blues classics such as, the epic ‘I’d Rather Go Blind’ (Etta James) and a romping ‘Let the Good Times Roll’ (B. B King). 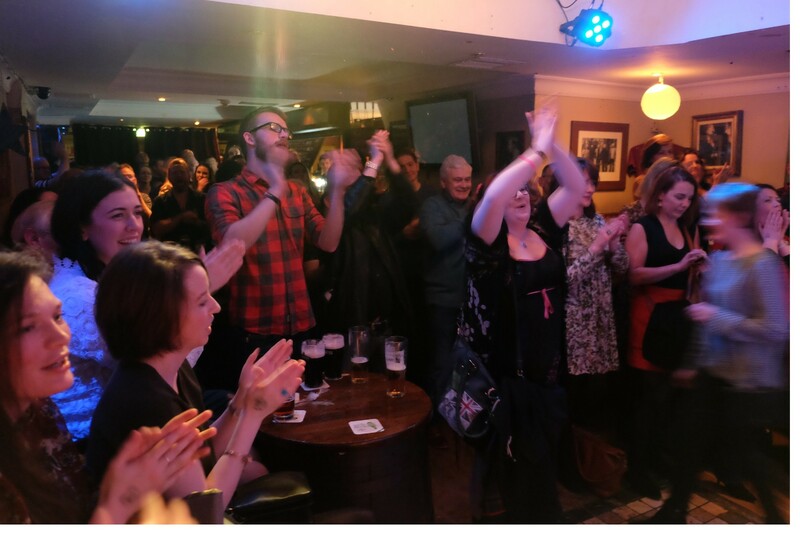 What made the night even more memorable for me was that we were joined by three very special guest vocalists, Claire McLaughlin and Paula Higgins and my wonderful mother Elizabeth Monahan! Their sublime vocals brought the sound to a whole new level and it was one of the pleasures of my life sharing the stage with these three women on this night of nights. All that was left on that stage at the end was blood, sweat and one or two tears… It was such a pleasure to perform for such a great crowd and I loved EVERY single moment of it. If you were there and you’re reading this thank you SO much for your support! 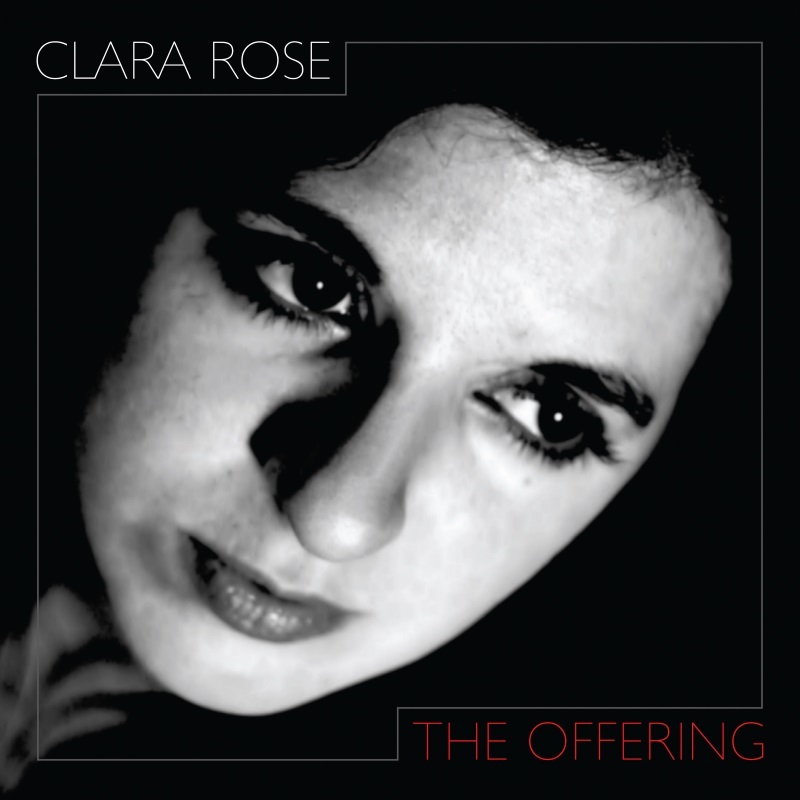 Clara Rose is set to release her second studio album, ‘The Offering’ on 17th February 2018. It is a collection of 10 songs that bring the listener on a journey through folk rock, blues, funk, soul and contemporary folk. 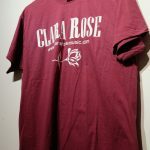 There are 9 original tracks penned by Clara Rose and Big Momma Thornton’s ‘Ball and Chain’ get’s the Clara Rose treatment as the penultimate track. The album was produced and recorded by Gavin Glass in Orphan Recordings over 7 days of peace, joy and sweet music. 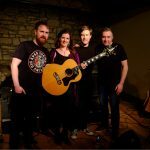 It features stellar performances from The Clara Rose Band (Sean Beatty, Tony McManus & Michael Black) aided by the musical professor Gavin Glass and guest appearances from vocalists Elizabeth Monahan, Claire McLaughlin and Paula Higgins. 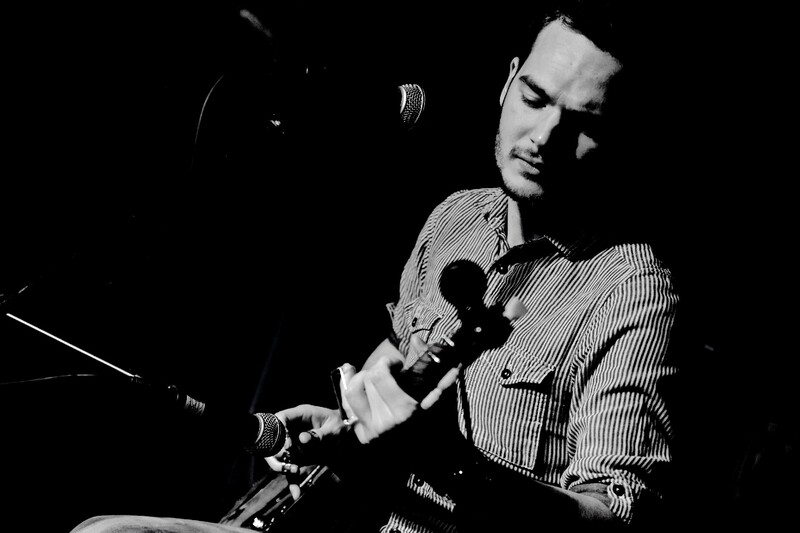 We were lucky enough to attain the talents of legendary brass section Michael Buckley & Ronan Dooney who make three tracks gleam with soul and violinist Cathy McEvoy adding to the rootsy folk elements of the work. 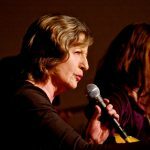 Clara Rose has been writing and performing for over 10 years – her acclaimed debut ‘A Portfolio’ (2010) brought her onto the scene and she hasn’t relented! 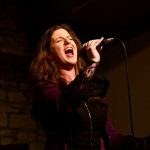 Her live E.P ‘Queen of the Late Night Radio’ (2012) ignited a collaboration with harmonica player/song writer Don Baker and she went on to appear on his album ‘My Songs, My Friends’ with a host of other Irish artists (including Brian Kennedy, Sinead 0’ Connor and Eleanor McEvoy), this collaboration developed into a nationwide tour and release of their album ‘Baker Rose’ (2016). 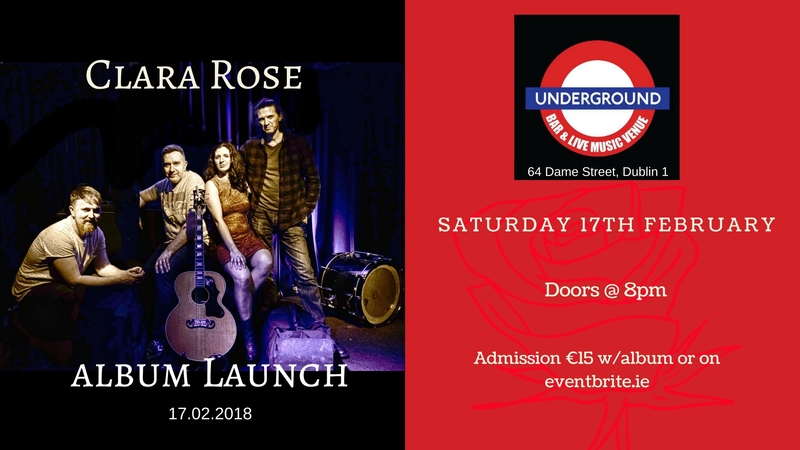 Dublin: ‘The Underground’ (64 Dame Street) 17th February, 8pm. Monaghan: ‘The Market House’ (Market Street) 24th February. 7.30pm.  Dublin: ‘The Underground’ (64 Dame Street) 17th February, 8pm.  Monaghan: ‘The Market House’ (Market Street) 24th February. 7.30pm. The song is a passionate tale of a type of love and the re-igniting of creativity following loss of that love. 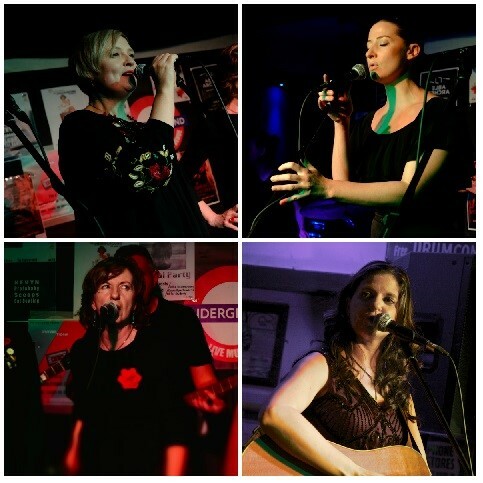 ‘Tightrope Walkers’ is performed by Clara Rose and her stellar band and features Paula Higgins on backing vocals. It was recorded and produced by Gavin Glass of Orphan Recordings. ‘Tightrope Walkers’ is the first single off her second solo album. It is accompanied by a video produced and directed by Mark Watson (Not Just a Pawn Productions) with special thanks to Lauren Trainor and Davi Hora Galway Community Circus. Her new music has taken a turn in the road, steering more towards melodic folk/roots but still tinted with the blues and always with ‘that’ unmistakable voice, the songstress: Clara Rose. 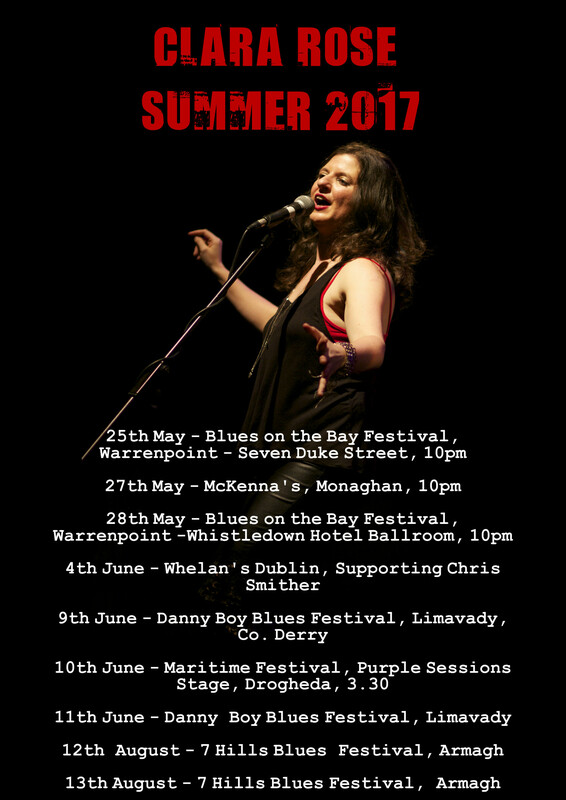 The Clara Rose Band will hit the road this summer – we are playing some of our favourite venues and blues festivals with details to be announced – hope to catch you on the trail! 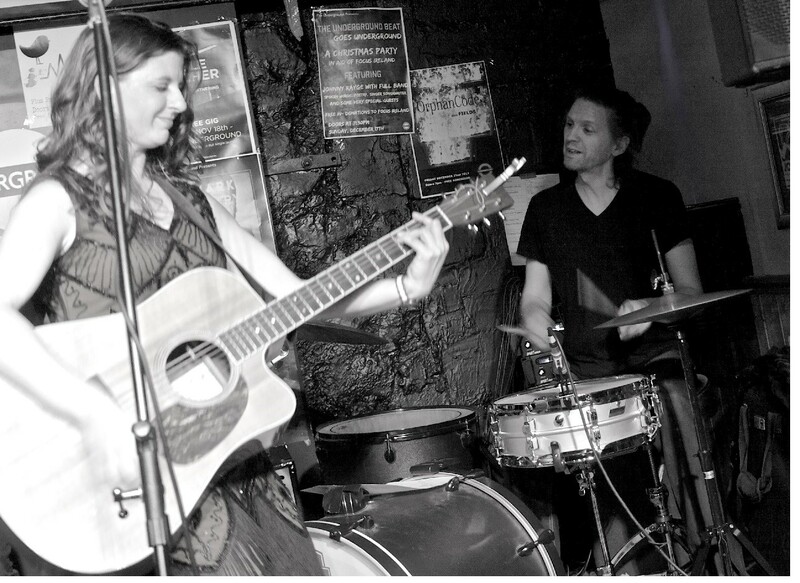 Also in BIG news Clara Rose will support one of U.S.A’s finest songwriters Chris Smither in Dublin’s premier music venue Whelan’s on Sunday June 4th. Don’t miss this special show!